If a Google search has just landed you on this LA County Docs page, please start by going through the checklist in the What's Hot box on the Home page. You won't get lost or delayed: The checklist will quickly bring you back here, if appropriate. Yes, this is the webpage that explains why in LA County, paying a red light camera ticket is voluntary/optional. 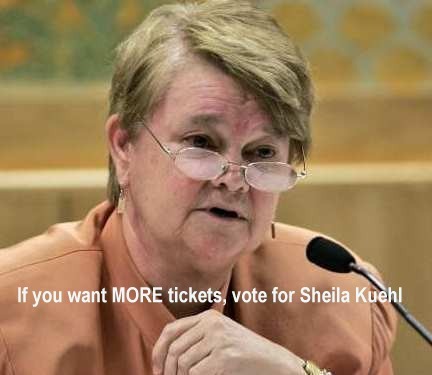 Zev "termed out," and in the Nov. 2014 election, Sheila Kuehl won the race to succeed him, by a narrow margin. During her career in the California Legislature, Kuehl made three attempts to pass bills to allow the use of automated speed enforcement (photo radar) in California. As an LA County Supervisor, she has a seat on the MTA/Metro board and she will be a vote to continue and expand Metro's huge (101 cameras, so far) red light camera system. Kuehl will be up for re-election in Nov. 2022. In LA County, Paying a Red Light Camera Ticket is Voluntary! The info here in Set # 2 is applicable to red light camera tickets from all cities in LA County, including those from the MTA. But only in LA County, and only if you haven't contacted the court about your ticket. The LA County Superior Court Does Not Report Ignored Red Light Camera Tickets to the DMV! "Officials say almost half of photo tickets are currently not paid, in part because the DMV has not been instructed [by the court] to place holds on licenses and registrations for those with outstanding [photo] citations." "There's no consequence for not paying the ticket on a photo red light [in LA County]. And currently if a percentage rate is paying and the general public understands that there is no consequence, there is a risk that many more will not pay. We have petitioned/appealed the [Los Angeles County] Superior Court to put teeth into this so that there will be a consequence. But that has met with the answer that they will not support it. "So there's no consequence [in LA County]. This is not in queue when you renew your drivers license. This is not in queue when you register your car." "If you receive a photo red light ticket... what we have in Los Angeles County is the courts have made the decision they will not refer them to the DMV to put a hold on a license (if the ticket is not paid)." In LA County, paying a red light camera ticket is voluntary (optional) - unless you've already contacted the court. Warning: Contacting the court (or its website lacourt.org, formerly lasuperiorcourt.org) to check the status of your ticket or to sign up for an extension lets them know that you received the ticket. If you then decide to do nothing further about the ticket and so do not take care of it by the due date (or the extended due date), it is possible that the court will report you to the DMV. It is OK to go to cite-web.com, photonotice.com, violationinfo.com or viewcitation.com to view the photos/video of the violation - those photo viewing sites are run by the camera companies, not the court. (c) pled "not guilty" (which often will prompt the police to do some more research). And that caused a real ticket to be issued in your name. Can you ignore that real ticket? If the first thing the police sent out was a real ticket (which then got re-issued to you), I don't know for sure if it is safe to ignore that ticket. So, I would like to hear from anyone who has ignored a real ticket which was issued after the owner responded to a Snitch Ticket or a real ticket. "Vehicle Code section 40509(c)(1) allows, but does not require, the Court to send notice to the DMV of any person who fails to appear in response to a notice subsequent to a traffic violation captured by an automated traffic enforcement system (i.e., red light camera system). The DMV is subsequently authorized to place a hold on the accused offender’s license, forcing the person to resolve the ticket prior to renewing his or her license. "The Court supports a collections effort [see "Will Your Credit Rating be Dinged?," below] whose results and efficiency are a model for the California courts. However, that collections policy has, for many years, not included the proposed notification to DMV. In creating and administering this collections effort, the Court’s policies are informed both by the need to follow through on the fines issued, and by the need to do so in a fair and just manner. "In the case of red-light camera enforcement, experience suggests that issuing a driver’s license hold on the basis of a red-light enforcement ticket could result in an unfair result where the owner of the vehicle is denied the ability to renew his or her license, even though that person was not the driver of the vehicle at the time the camera captured a person going through a red light. "A failure to appear on a red-light traffic citation per notification from the Court results in penalties in addition to the original fine and the matter will be referred to a collection agency [see "Will Your Credit Rating be Dinged?," below] if not resolved in the time allotted to do so. "Questions related to credit scores [see "Will Your Credit Rating be Dinged?," below] and insurance premiums should be directed to those businesses." "We are not aware of any judicial officer ordering or authorizing GC Services to garnish wages or other income, attaching bank accounts, or filing liens. "Just as there is concern about requesting that the Dept. of Motor Vehicles place a hold against the license of a person who is not responsible for the red light camera violation, the same concern applies to authorizing severe collections methods [see "Will Your Credit Rating be Dinged?," below] against a person who may not be responsible for the infraction. "As is true in evaluating any action presented in our courts, in situations where sufficient ambiguity exists, our judicial officers must not impose a judgment that is not supported by the facts or the law. "Our judicial officers must balance their responsibility for enforcing the law with their responsibility to protect the public from abuse of those laws." In September 2011 memos about the closing of that city's cameras, Gardena Police Department personnel described the efforts being made to get the Court to change its policy. A Sep. 8, 2011 LA Weekly article (archived copy) described the way the LA Superior Court handles red light camera tickets. "PERMANENT RESIDENTS, DON'T IGNORE IT! I got a camera ticket in La Habra, barely outside of Covina, this April on my brothers car. So he ends up receiving the ticket for $495 in his name but my photo. Me & my brother have been permanent residents for 20 years. Unfortunately I can't ignore the ticket cus that's putting him in jeopardy. Plus I read the part about the ticket remaining in court records, so that means taking a risk to be denied citizenship when finally applying in the near future. If you're a permanent legal resident & you plan to apply for citizenship, it's a no brainer, don't risk it. Pay the half grand in community service if you have to." April 2013 online comment found on the Sep. 8, 2011 LA Weekly article. Highwayrobbery.net does not know if the commenter (in box above) is a reliable source, because neither the City of La Habra (in Orange County) nor the City of La Habra Heights (in LA County) has ever had red light cameras, and the closest either comes to Covina is six miles. Rowland Heights, which is immediately north of La Habra Heights and comes within four miles of Covina, had some cameras but they were shut down in May 2012, long before the commenter got his ticket. But just to be safe we suggest that if you plan to apply for citizenship and you have received a real red light camera ticket from a city in LA County, or from the MTA, check with your immigration advisor before ignoring that ticket. You still will be safe ignoring a Snitch Ticket. If you end up in traffic court for some other violation, and the judge asks you about that red-light skeleton in your closet, the same ignore-at-all-costs rule applies. "If you then acknowledge, 'I thought those were being dismissed,' you are now under the jurisdiction of the court," says [Attorney Sherman] Ellison. 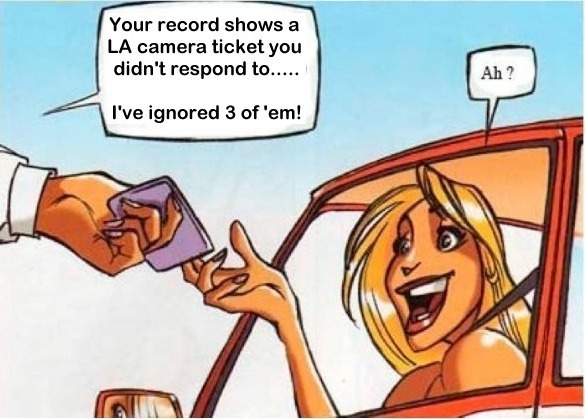 I've not actually heard from anyone who reported that during a traffic stop the officer brought up the motorist's ignored LA County red light camera ticket, so the advice given in this cartoon is for "just in case things change." Or, if it comes up in court. As of Dec. 2014 the Mar. 2012 article had 76 comments. As of Dec. 2014 the Jan. 2014 LA Weekly article had 209 comments. In Late 2011, Revenue was Down - by Half ! Court-provided revenue reports showed that in Summer 2011, the time when the major media first wrote about the ability to ignore red light camera tickets in LA County, red light camera ticket revenue dropped sharply. This example graph, by highwayrobbery.net, covers May 2010 to Oct. 2014. The lowest point was Aug. 2011. For the very latest graph, click on Revenue Spreadsheet, below. During the Summer of 2011, revenue was off by about half. But that didn't mean that half of those ticketed by LA County cities still were paying their camera tickets; if 60% (a guess) were paying their tickets prior to June 2011, right after June 2011 it was more like 30%. Between Jan16 and Jun16, these reports were not available. As of Mar. 2019 the Jun18 to Dec18 reports were delayed, due to system and software updates at the Court. Why Did the LA County Court Decide to Not Report Ignored Tickets to the DMV? The 2011 press releases (above) contains the official explanation. But the cost of providing arraignments and trials for the 100,000+ red light camera tickets issued annually could have been a factor. And in 2012 there was a forced layoff of 1/10th of all Court personnel. What Will Happen If You Ignore It? At about the same time as your ticket arrives in the mail, you will receive a bail notice directly from the court letting you know how to pay and get traffic school, and how to set up a trial if you want to fight the ticket. It will also warn you about things which could happen if you do not contact the court by the due date. If you don't contact the court by the due date, they will send you a notice saying that a $300 fee is about to be added to your fine - unless you respond within 20 days. There will be no warrant for your arrest. Will Your Credit Rating Be Dinged? No ! You may receive one or two letters (example below) from the LA County court's collection agency, GC Services, but your ignored ticket will not show up on your credit report. "Under rules that took effect last week, government agencies may no longer lower a motorist's credit score over unpaid traffic tickets or parking citations. The three major credit reporting agencies, Experian, Equifax and TransUnion agreed to the new policy in a legal settlement with thirty-one state attorneys general last year." Please also be sure to read the Court's August and September 2011 press releases, above. Paying a LA County red light camera ticket is voluntary (optional) - unless you've already contacted the court. 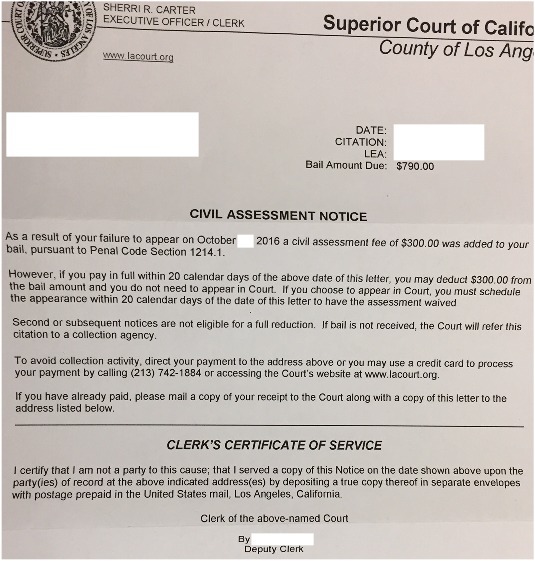 If you contact the court ( or its website lacourt.org, formerly lasuperiorcourt.org ) and check your ticket status or sign up for an extension, that acknowledges that you received the mailed ticket. If you then decide to do nothing further about the ticket and so do not take care of it by the due date (or the extended due date), it is possible that the court could report you to the DMV. I do not know for sure. It is OK to go on cite-web.com, photonotice.com, violationinfo.com or viewcitation.com, to view the photos/video of the violation - those photo viewing sites are run by the camera companies, not the court. So, Do You Pay, or Not? The decision to not report ignored tickets to the DMV was by the court, so it applies to ALL red light camera tickets in LA County, whether issued by the county sheriff, the MTA, or by a local police department. Thus, were you to ignore the ticket, you would have a lot of company. About 1/3 of the tickets are ignored, so by now there's probably several hundred thousand people - just in LA County - in the same boat as you would be. Plus, were the court to change its mind, the most you would have to pay is $300 extra. And there could even be an amnesty, like the one that began in 2015 (see below). How Many People are Ignoring their Tickets? Some lawyers and most of the $99 ticket fixing companies will advise you not to ignore these tickets in LA County. Or, they may fail to tell you that there's the option to ignore. Why? The lawyer may be concerned that you will blame him if you ignore the ticket and then for some reason the court decides to start reporting ignored ticket to the DMV. And the ticket fixing companies just want your $99. It has been reported that staff in the office of a local councilman, and a reporter for one of the local daily newspapers, have been advising callers and readers that tickets from the red light cameras near the MTA/Metro busways and light rail cannot be ignored - the suggestion being that somehow, MTA/Metro camera tickets are stronger than those issued by the cities in the County. The best indicator that their advice is incorrect is that in 2012 the MTA asked a state legislator to carry a bill which would have required the courts to issue bench warrants on ignored MTA/Metro tickets. MTA's official reports of the percentage of tickets paid (available on the MTA Docs page) show why they were so concerned. as of Dec. 2013 only 21% of the tickets issued in Dec. 2012 had been paid. The 2012 bill did not pass, but then in the 2014 session there was a new bill which could have been amended to require warrants. Had it passed (it did not), it would have gone into effect on Jan. 1, 2015. In 2017 there was another bill, SB 185, which could have changed the rules beginning on Jan. 1, 2018. It did not pass, but a similar rule change could be included in a bill in a later year. This table, part of a 2015 report critical of California's traffic courts, shows that beginning in 2011, something reduced the number of license suspensions. Part of the reduction may be because of the LA County court's policy to not report ignored red light camera tickets to the DMV. From "Not Just a Ferguson Problem - How Traffic Courts Drive Inequality in California"
Will the LA court someday change its policy, and begin pursuing the old red light camera tickets that have been ignored? About 1/3 of all camera tickets are ignored, so there's so many that it would be impractical for the court to pursue them. They don't have enough parking, clerks, judges, or courtrooms. And, they have higher priorities, like dealing with crooked politicians, robbers, and murderers. The closest the courts get to pursuing old tickets is that every few years they do a statewide amnesty, offering a discount to people who want to pay off their old tickets. See Amnesty, next. Do you have an OLD ticket that you've been meaning to pay? In late 2014 an effort (archived copy) began to start a pilot program to give the courts a greater incentive to pursue the collection of fines [see "Will Your Credit Rating be Dinged?," above]. By 2015 that effort had morphed into an amnesty which ran from Oct. 1, 2015 to Mar. 31, 2017 and offered various levels of discounts off the fines, with the largest discounts going to motorists with low income. See the big box near the top of Section # 4, Handling Your Ticket, on the Your Ticket page. The red light cameras in LA County are operated by seven cities (Beverly Hills, Commerce, Covina, Culver City, Hawthorne, Montebello, West Hollywood), plus the MTA/Metro, which has over 100 cameras near its light rail lines and the Orange Line busway. Even though most of Metro's cameras are located inside the City of Los Angeles, the tickets are not signed by the LAPD. The LA County Sheriff signs Metro's tickets, and also signs those from the cameras in Commerce and West Hollywood. Each of the eight contracts with a red light camera company of its choosing, and that company installs the cameras. For more info about the camera companies, read FAQ # 34. All of the red light camera tickets from the seven cities and Metro are filed in the Los Angeles County Superior Court. If you are having trouble figuring out which city issued your ticket, read the Disambiguation section, at the bottom of the Camera Towns page. A ninth group of cameras enforce stop signs in parks in the Santa Monica Mountains and Pacific Palisades. The fine is $100.00, the tickets do not carry a "point," and they are not filed in the Superior Court. Those cameras are operated by the Mountains Recreation and Conservation Authority, or MRCA. There may be some more information posted in the next few weeks. Mark your calendar to remind you to come back here and look!